It's the season of mornings cocooned under the comforter and hot chai and garam pakodas. It is also the season of damp clothes that just won't dry, and the smelly wet odour you wear dampens your spirits and causes heads to turn for the wrong reason! Needless to say, baby laundry is a challenge during the rainy season. Worse still are the rashes on baby's delicate skin because of damp clothes, or baby's sweet smell being replaced by a nose-curling odour. Baby's laundry is more in number and is harder to air dry due to the moisture in the air. Here are some tips that can make you an expert at baby laundry in a jiffy. Fabric choice. You might be tempted to pick up thick fabrics to keep your baby warm. The exact opposite is better from the standpoint of quick washing and drying. Choose thinner fabrics and layer them to give baby warmth. Thinner fabrics dry out more quickly and are less likely to retain sour odours. Wash it right. Avoid laundering baby's clothes in the washing machine used for the rest of the family. Germs and infection from other dirty laundry can adversely affect baby's skin. Hand wash baby's clothes with a detergent that is free from harmful chemicals, bleaches, fragrances and dyes. Ensure you rinse clothes until the water stops foaming, and the water is completely clean. Leftover detergent can cause baby rashes. Tough stains. If baby's saliva has dried on his bib, or there are stains on the fabric, just soak these items in warm water with detergent for thirty minutes to get rid of the stains and germs. Dry as a twig. To dry washed clothes quickly, use a clothes hanger and put it by a window under the fan. This will help the laundry dry quickly and get rid of any odour. Add finishing touches by ironing baby's clothing to let the heat kill germs and bacteria. Wash often. Washing dirty laundry as often as possible is advised to prevent rashes, allergies and infections from urine or saliva. Keep baby's skin dry, fresh and fragrant while you both enjoy the monsoon! Almonds are great for us. That's age-old wisdom. Now imagine a thousand almonds crushed to produce one drop of golden almond oil. Voila! You have an oil that has multiple uses to heal, tone, soften and tighten baby's skin! The physical development of a baby in his first five years is exponential. Baby's skin stretches, her body grows, baby's organs develop, and her hair becomes thicker, stronger and longer. Almond oil is like a gentle caregiver that can support baby's body through this growth phase. Why is almond oil great for baby's skin? Almond oil has fatty acids that naturally lock in moisture and keep baby's skin hydrated. It is power packed with immunity-boosting properties which improve baby's ability to fight infections. Almond oil is a rich store of Vitamins E and D to keep baby's skin smooth and supple. It has anti-inflammatory properties to reduce inflammation and itching. Rich almond oil promotes blood circulation and hair growth. 1. Size and shape. Choosing the right size will save your baby from rashes, itchy skin and skin inflammation. 2. Super absorption. 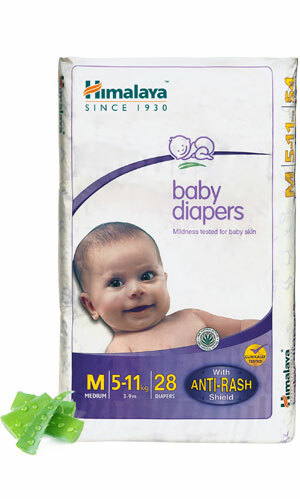 A diaper that has superabsorbent polymers (SAP) keeps your baby's tender skin free from chaffing from moisture. 3. Stretchable elastic edges. Quality stretchable sides prevent gaps and thus leakages, ensuring a comfortable fit. 4. Anti-rash shield. It's wise to be proactive about diaper rash. Diapers that have an anti-rash shield are an intelligent choice to keep baby's bottom protected from bacteria and microbes. Make a wise choice for your baby! Himalaya's Baby Diapers have an anti-rash shield that prevents the formation of bacteria and microbes which can cause rashes. It has a silky soft inner layer infused with the goodness of herbs like Aloe Vera, to soothe baby's bottom, and Yashada bhasma which inhibits the growth of bacteria and microbes.